Slava Isusu Christu! - Glory to Jesus Christ! Slava Naviki! - Glory Forever! With the help and generosity of our parishioners, our church's original icons from 1916 are being restored! Click the icon below to see photos of the icons and learn more. To all who are tired and need rest; to all who mourn and need comfort; to all who are friendless and need friendship; to all who are discouraged and need hope; to all who are hopeless and need sheltering love; to all who sin and need a Savior; and to whomsoever will, this church opens wide its doors in the name of the Lord, Jesus Christ. Welcome! Saturday - 5:30 p.m. * Sunday - 10:30 a.m.
Click the 100th Anniversary banner below to see photos from our Centennial Celebration. **Click here to see a slideshow of our 100th Anniversary banquet held on October 18, 2009 at Genetti's in Hazleton, PA. The photos were taken by parishioner Barbara Nagy. **Click here or here to see different slideshows of our Centennial Parish Picnic on Sunday, July 19, 2009. **Click here to see a slideshow of our parish's history. The presentation was created by parishioner Joe Roll as part our Centennial Celebration. *NOTE*: The slideshow will open in a new browser; depending on the speed of your internet connection, it may take a few minutes to load. **Click here to see a slideshow of our 2008 Christmas Dinner and Inauguration of our Parish's Centennial year - 2009. The dinner took place on January 4th, 2009. **Click here to see a slideshow of Good Friday & Easter 2008 at our parish. The Catholic Church is in fact a communion of sister Churches which in total beautifully reflect the universal nature of the Catholic Church. The Roman Catholic Church, albeit the largest, is one of 27+ Catholic Churches (formerly called rites) which pray and worship according to different styles and traditions. These are traditions which developed long ago in vastly different areas of the world and which today represent a different approach to worship, theology and spirituality within the Catholic Communion of Churches. We often say that these Churches all have unity especially of doctrine but not uniformity of prayer and worship. They are all in full communion with the Pope. One can then say that the Catholic Church is made up of the Roman Catholic Church and 21+ other Eastern Catholic Churches of equal dignity each of which uses its own name. 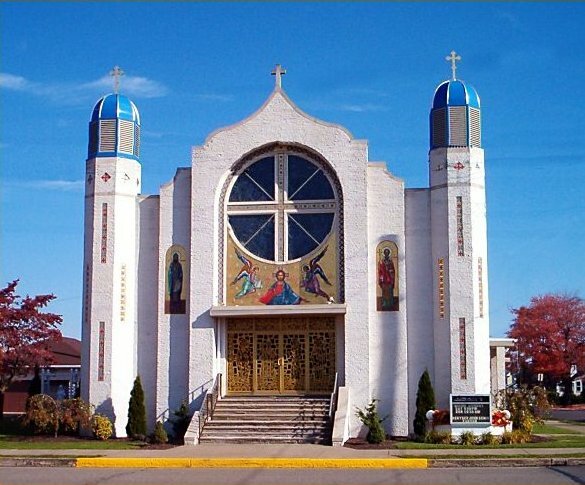 The greater number of these 21+ Eastern Catholic Churches follows the Byzantine tradition and so they are often called Byzantine Catholic Churches and sometimes use other names as well. Ss. Cyril and Methodius Church in Berwick belongs to the Ukrainian Catholic Church and welcomes all who seek to worship according to its rich Byzantine tradition. We see it as our unique mission to provide area residents with this beautiful and very Catholic approach to prayer and worship.